Getting Your Child Excited About Going To the Eye Doctor! Home » Bright Eyes Best » Bright Eyes is Getting Bigger! Bright Eyes is Getting Bigger! Hi, it is Dr. Nate with good news! 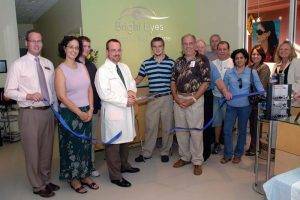 As longtime patients know, Bright Eyes Family Vision Care was started in a very small location. Located in the West Park Village in the Westchase neighborhood of Tampa, we occupied the space on Montague street where the Coldwell Banker is now. In 2006 we were only open part-time and with less than a thousand square feet. There was one exam room, one vision therapy room, and no separate doctor’s office or designated areas for diagnostic testing or contact lens training. Our office grew quickly and soon with myself and four employees, we barely had room for patients! So we moved to the Linebaugh Ave location next to Sylvan Learning Center where we are now. With more space, we hired more staff and continued to grow. But we discovered that patients who came to see us from farther away to the north and east, such as Gainesville and Lakeland had a hard time getting through Tampa traffic. So we opened Bright Eyes Kids in New Tampa in 2014. We have continued to grow. We are up to almost 20 employees! Now it is 2018 and we want to add more eye care staff, but we have no place to put them! Staff members are already coming to blows over seats and computers! OK, not really, but it is crowded. What a problem to have! As it turns out, the Sylvan Learning Center has moved to a different location and since the vacant location is next door to us, we are taking it over. The new combined spaces will be almost three times as large as the current space. We will have more exam rooms, more vision therapy rooms, a larger optical, a conference room, a larger waiting area with a separate kids area, and even more features. It will also mean hiring more excellent staff! 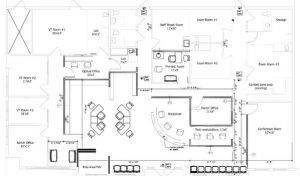 We will begin by remodeling the Sylvan location and then we will update the current Bright Eyes location. Yes, there will be a “Please pardon our dust, while we make improvements to serve you better” sign up. But we WILL remain open during the construction. To be clear – Bright Eyes is not moving, just expanding. The address, phone number, and everything will stay the same. We are VERY excited about this project. It will allow us to make many improvements such as shorter waiting times for appointments and for glasses. The expansion should be complete very early in 2019. Myself, Cristina, Dr. Beth and the rest of the Bright Eyes Team are so very thankful that our patients trust us with the care of themselves and their family. It means a great deal to us that we can continue to do what we love even better in 2019! If you have questions, suggestions, or recommendations about the expansion, send them to me at Doc@BrightEyesTampa.com or leave them in the comments. To save yourself time, print these forms and fill them out at home before your visit. Vision Therapy patients and parents have some amazing stories to share! Dr. Nate Bonilla-Warford and Dr. Beth Knighton are residency-trained pediatric optometrists and see patients of all ages.